The Polish capital is also the country’s largest city. Warsaw is filled with urban Polish culture and history. Filled with museums, restaurants, and other activities, there is plenty to do for the tourist. Unlike other Polish cities which are built around an old city center, Warsaw is spread out across a wide area. Mass transit consists of buses, trams, and metro lines. Bicycling is another highly utilized form of transportation for seeing the city. Bicycles can be rented at hundreds of locations throughout Warsaw. The city has an active nightlife. The social life of the upper crust in Warsaw typically centers in the wealthy western and southern suburbs like Konstancin, which is full of multi-million dollar homes. Foreigners rarely get to see these suburbs, but this where you can generally find the best looking upper-middle class and upper class women. They rarely visit Warsaw’s Centrum for the same reason that the affluent Los Angeles residents rarely visit downtown LA. If you prefer your sights a little more toned down, head to the pillared facades of the Lazienki Palace and its impressive lakefront views, or to the manicured lawns of the vast and equally striking Wilanów Palace. Or wander through the streets of "The Old Town". The shopping scene’s pretty impressive, too, with plenty of handmade products to splash (relatively insignificant amounts of) your cash on, before heading for the nearest restaurant to delve into an impressive array of stuffed dumplings washed down with a shot of bison vodka (which, for the record, is flavored with local bison grass, as opposed to the large cow-like creature). At first glance, Warsaw can come across as dull, but this is one of those destinations you learn to care for after digging deep, and several layers down it is extremely loveable. See a few sights, have a few nights out, and you’ll soon find the uninspiring, downbeat vibe has washed away. 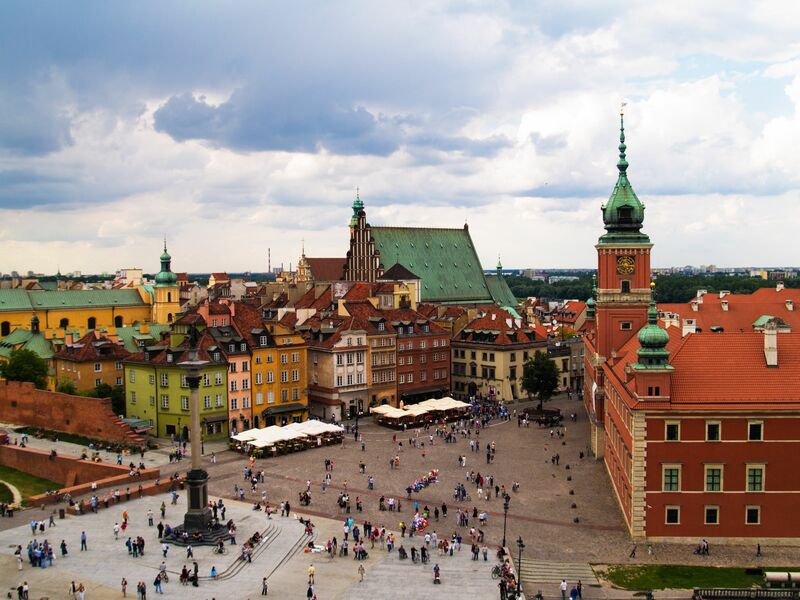 Given time, most visitors love Warsaw. See an error? Want to suggest something special? Feel free to take part in a discussion on Warsaw. Currently there are no places in Warsaw. Currently there are no articles about Warsaw. Currently there are no trip reports about Warsaw. Currently there are no photo of Warsaw. Currently there are no videos of Warsaw.